2019 Spring conference will be held May 9, 2019 at the Highlands Ranch Law Enforcement Training Facility. Please check back for conference details. We hope to see you all in May! To educate and train Colorado Law Enforcement Agencies on the collection, preservation, storage, safety standards and disposal methods as it relates to evidence and property. Please see the jobs tab for further information. 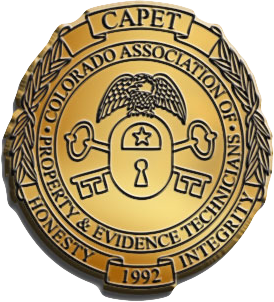 CAPET members have direct access to newsletters, forums, and upcoming events. Thank you to our Corporate Members for their continued support!